Looking for New Wire Mesh Decks? We have them in Stock! 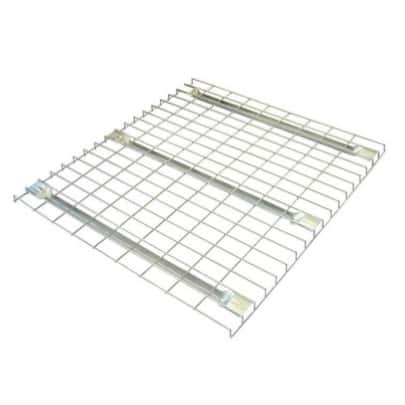 We Stock Thousands of New Wire Mesh Decks In All Sizes. Ask About Our Quantity Discounts! Wire decking for pallet rack systems is a great way to optimize the use of your racking equipment. Wire decking allows you to store smaller items that aren’t palletized on your pallet racking system.Beyond the obvious benefits associated with even distribution of weight across the racking system, wire mesh decking has additional benefits. First, wire decking reduces shadows in your warehouse by allowing for more even distribution of light across the floor. Fewer shadows in your warehouse means a safer environment for all of your employees. In many states and/or counties throughout the nation wire decking is preferred and in most cases required by the fire inspectors if you are going to create any type of supported shelf levels throughout your pallet racking system. 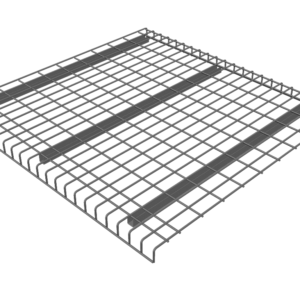 There are different styles of wire mesh decks to choose from depending on your specific application in your warehouse. Wire decks are constructed from heavy duty steel wires and roll formed steel U-channel supports. The wire thickness can vary depending on capacity requirements. Wire decks typically range in capacity from 500 lbs per deck up to 4500 lbs per deck. This is entirely dictated by your specific application/s and product weights that are going to be stored on the wire decks. The typical wire thickness or gauge is 6 ga. The wire mesh patterns themselves can vary but the most typical is a 2.5” x 4” wire mesh pattern. Waterfall Wire Mesh Decks- are the most popular wire deck on the market today. Universal Type- Have a flange at the end of the channel which enables the decks to fit securely on a step, box or structural beams. Reverse Waterfall Type- Wire Decks have a lip in the rear that prevents product from being pushed off the self when stocking and picking. Wire Decking is good to use when you have smaller products that you would like to store in your pallet rack system vs. palletized products. They also help prevent your pallets from falling through between the beams while loading and unloading your products. Wire decks come in a variety of styles to fit your particular storage application. The most common Wire Deck is a “Waterfall Type”. The waterfall lip sits on the topside of the beam and waterfalls over outside of the face of the pallet rack beam to secure it in place. The Channel supports sit in the step of the beams to provide support. Installation: Wire Decks are Easy to install. Just drop them in to place. Safety: Wire Decks provide protection to your employees and products. Visibility In Warehouse: Light can shine through the surface of the Wire Deck vs. a solid shelf. Dust and Debris Free: Dust and other debris is allows to fall through.